The above info came from hamstarz, and was edited by yours truly (contact me). The image came from Amazon.com. Catnapped! 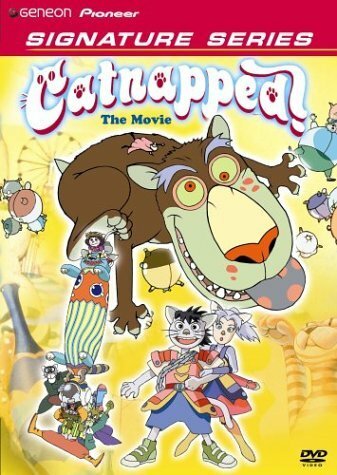 is the story of two children, Toriyasu and his little sister Meeko, trying to rescue their dog from the paws of an evil cat princess, Buburina, and her slavish assistant, Doh-Doh. Buburina plans on bringing the cat world Banipal Witt under her complete control with the help of Papadoll (who Doh-Doh can control by use of the Sorcerer's Arm he stole from Master Sandada) and a giant mouse she made and filled with her balloonified prisoners, which she could use to taunt the Sleeping Cat (Banipal Witt's physical support) and possibly awaken him. This spells disaster for Banipal Witt. Luckily, three cats, Hoi-Hoi, Henogee, and Suttopoke, arrive at Toriyasu's house late one night and take him and Meeko to Banipal Witt. Upon arriving, the sun changes them into cats. They discover that their dog has become a giant monster, because if any outsider stays for more than a day in Banipal Witt, they will suffer the same fate. Toriyasu needs to return his dog to normal and take him home while avoiding Buburina and her strange ability to turn anything she touches into a balloon, and also returning before the sun rises again. The above description came from Skiba, and was edited by yours truly (contact me). Catnapped starts out with a girl looking at a dog house; the chain that's hooked up to it was cut. The girl's name is Neeko. She has a brother named Toriyasu. The siblings' dog is named Papadoll. Toriyasu says Papadoll ran away (he doesn't care for the dog), but Neeko says he was stolen. Later, the siblings start to walk to school. Neeko starts to notice strange cats wearing clothing. Then, she notices one holding a weird looking gadget. When it became nighttime, those strange cats enter the sibling's bedroom. And oddly enough, they can speak their language. One cat notices a picture of Papadoll and Toriyasu, and realizes that they've found the owner of Papadoll, and thus start to wake him up. Neeko wakes up and notices the cats. Neeko and the cats scream, while Toriyasu continues to sleep, so Neeko wakes him up for them. Now, she wants to come with Toriyasu no matter what. One cat with a gadget uses it to lure the cat-shaped blimp over to the house. Toriyasu wakes up and is super surprised. The blimp teleports off to a strange land called Banipal Witt, also known as the land of cats. Then when Toriyasu and Neeko leave the blimp, they turn into cats! It's because of the sun in the land of cats. Neeko and Toriyasu learn that Papadoll really was stolen by two cats named Burburina and Doh Doh. They turned Papadoll into a crazed, mad flying dog that Doh Doh controls with a giant glove. When Burburina gives a single touch to a cat, it'll turn into a balloon. Papadoll is attacking the land of Banipal Witt. The only way for the dog to stop that is if he remembers Toriyasu. If he remembers him, he'll turn into his normal earthly form. Also, there's this giant cat called the sleeping cat. This cat has tree roots that's around his back. The roots hold up Banipal Witt. If the sleeping cat moves, Banipal Witt will be destroyed. So, the sleeping cat must never awake. Burburina plans to fill the cat balloons into a giant mouse balloon. If the mouse balloon floats near the sleeping cat, the cat will think it's real and wake up. Which means Banipal Witt will be destroyed.